Liverpool teenager Raheem Sterling is going to be the best player in England and the country needs to support him, says Reds captain Steven Gerrard. Sterling was criticised after England boss Roy Hodgson said he asked to miss a Euro 2016 qualifier due to fatigue. Reds boss Brendan Rodgers described the 19-year-old's treatment as "unfair". "The media and the public have got to be behind this kid because he's going to be the best player in the country," said Gerrard after the 3-2 win at QPR. However, former England captain Alan Shearer insists he "does not know what burnout is" after questioning Sterling's stance. 17 Oct - Liverpool boss Rodgers says Sterling criticism is "grossly unfair"
Sterling's attitude came under scrutiny after Hodgson revealed the Liverpool winger told him that he was too tired to start last Sunday's qualifier in Estonia. He did appear as a 64th-minute substitute, winning the free-kick which England skipper Wayne Rooney converted for a 1-0 win. Afterwards Rodgers denied playing any part in Sterling's request, while Hodgson questioned the Northern Irishman's claim that some players need a two-day recovery period after matches. But Sterling put the controversy behind him by helping set up all three of Liverpool's goals in Sunday's thrilling Premier League win at QPR. His quick free-kick led to Richard Dunne's own goal, before driving runs set up Philippe Coutinho and another own goal from Steven Caulker. "I thought his cleverness and brightness led to the first goal," said Rodgers afterwards. "The best players come alive when the game goes dead. "And the breakaways for the other two, they are just all about his speed, his technique, his courage to carry the ball, run with the ball." Rodgers reiterated after the QPR game that he had not fallen out with Hodgson, who watched Sterling's performance from the Loftus Road stands. And Shearer, who played 63 times for England before retiring from international football in 2000, admitted the situation left Rodgers with a "difficult problem". 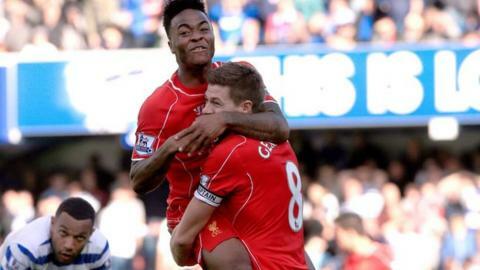 But he told BBC MOTD2 Extra: "I would love to know what Raheem Sterling said to Roy Hodgson. "What I would say is that you are very rarely 100% fit going into any football match. I do not know what burnout is. "Lionel Messi started international football at 17, went through the U20s, U23s, and now he has 96 caps with Argentina. "He plays every single week for Barcelona and is the best player I have seen in my life. He never wants to sit out a game. Has Messi had burnout?"